Not keen on scaly or slithery things? Probably best to give this a miss – or try and overcome your fear. Full of snakes, lizards, turtles, crocodiles and even venomous lizards, this is where our reptiles are kept. With Meet the Reptile Sessions taking place daily – why not go that extra step and touch one? 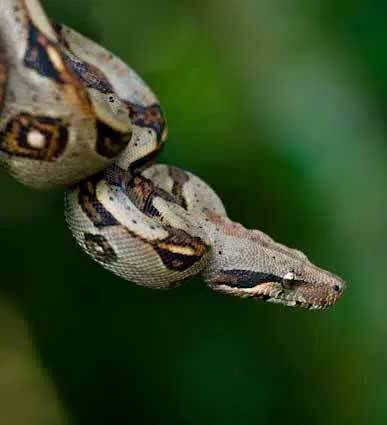 The reticulated python (Python reticulatus) is a species of python found in Southeast Asia. 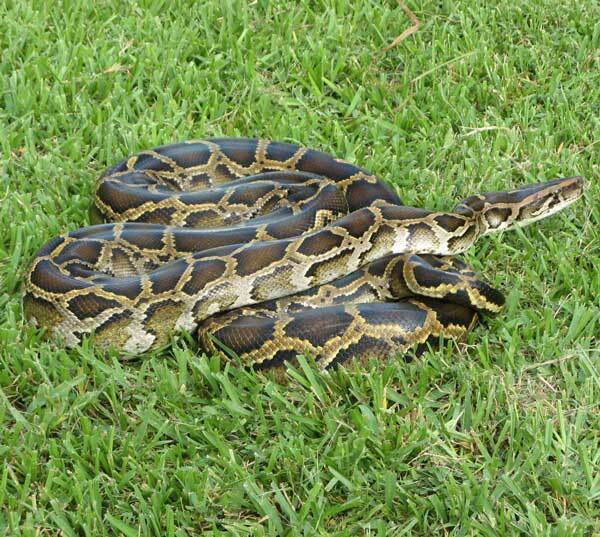 They are the world’s longest snakes and longest reptiles, and among the three heaviest snakes. 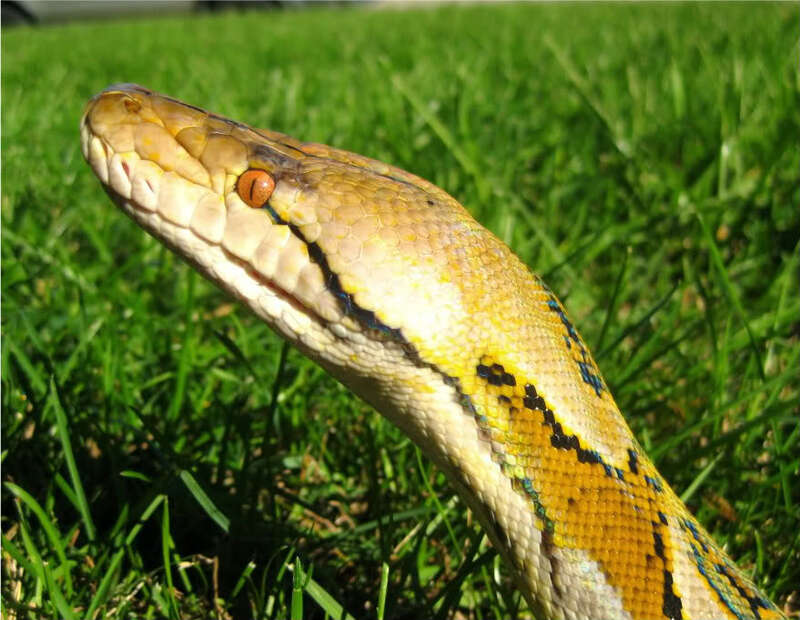 Like all pythons, they are nonvenomous constrictors and normally not considered dangerous to humans. However, cases of people killed (and in at least one case eaten) by reticulated pythons have been documented. The green anaconda (Eunectes murinus), also known as the common anaconda and water boa, is a non-venomous boa species found in South America. It is the heaviest and one of the longest known extant snake species. 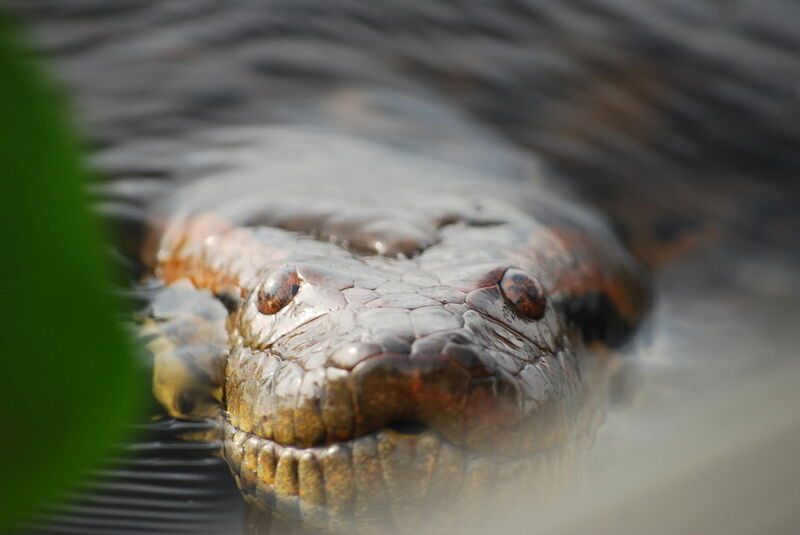 The term anaconda often refers to this species, though the term could also apply to other members of the genus Eunectes. The spectacled caiman is a Small and medium-sized crocodilian. Males of the species are generally 1.8 to 2 m (5.9 to 6.6 ft), while females are smaller, usually around 1.2–1.4 m (3.9–4.6 ft). The body mass of most adults is between 7 and 40 kg (15 and 88 lb). The maximum reported size for the species is 2.5 m (8.2 ft), with a body mass of 58 kg (128 lb) but they can growing up to 3 m in length potentially. The largest female was reportedly 1.61 m (5.3 ft) long and weighed 20 kg (44 lb). 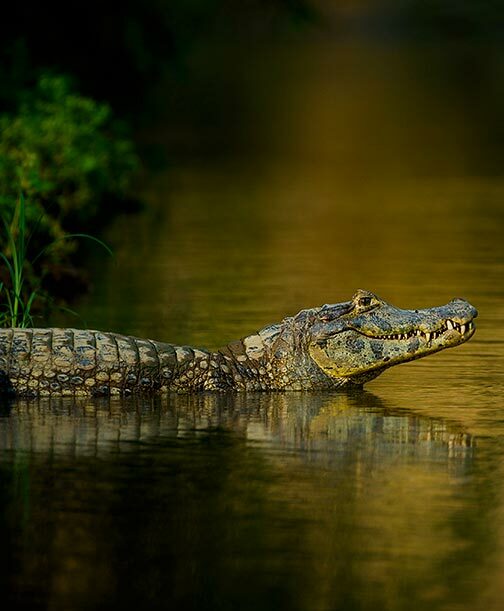 Caimans from the Venezuelan llanos are reportedly larger-bodied than specimens from Mexico. 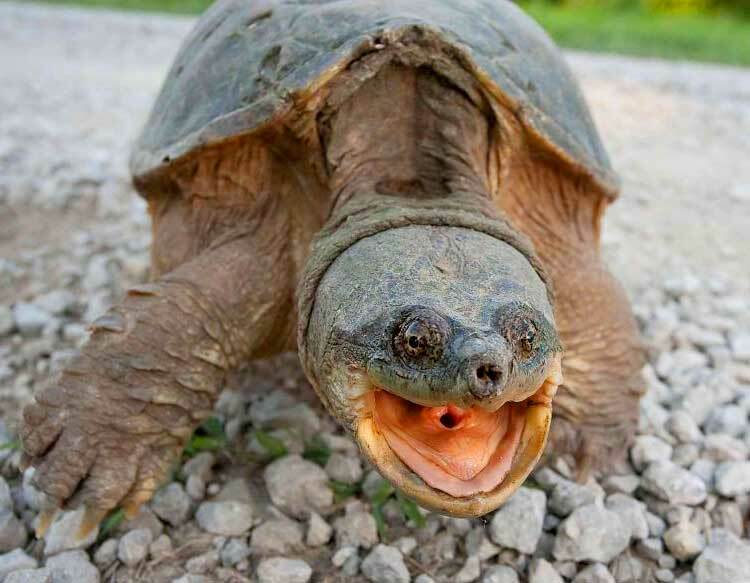 The common snapping turtle is a large freshwater turtle of the family Chelydridae. Its natural range extends from southeastern Canada, southwest to the edge of the Rocky Mountains, as far east as Nova Scotia and Florida. This species and the larger alligator snapping turtle are the only two species in this family found in North America (though the common snapping turtle, as its name implies, is much more widespread). 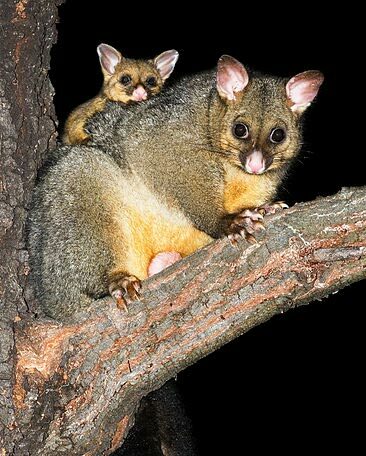 The common brushtail possum has large and pointed ears. It has a bushy tail (hence its name) that is adapted to grasping branches, prehensile at the end with a hairless ventral patch. Its forefeet have sharp claws and the first toe of each hind foot is clawless but has a strong grasp. The possum grooms itself with the third and fourth toes which are fused together. It has a thick and woolly pelage that varies in colour depending on the subspecies. Colour patterns tend to be silver-gray, brown, black, red or cream. The ventral areas are typically lighter and the tail is usually brown or black. The muzzle is marked with dark patches. The tailless tenrec (Tenrec ecaudatus), also known as the common tenrec, is a species of mammal in the family Tenrecidae. 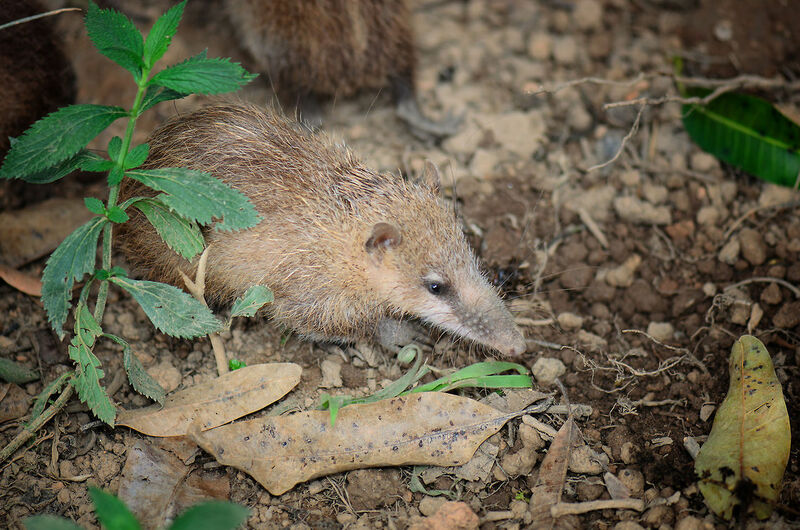 It is the only member of the genus Tenrec. Native to Madagascar, it is also found in the Comoros, Mauritius, Réunion, and Seychelles, where it has been introduced. Its natural habitats are subtropical or tropical dry forests, subtropical or tropical moist lowland forests, subtropical or tropical moist montane forests, dry savanna, moist savanna, subtropical or tropical dry shrubland, subtropical or tropical moist shrubland, subtropical or tropical high-altitude shrubland, subtropical or tropical dry lowland grassland, subtropical or tropical high-altitude grassland, arable land, pastureland, plantations, rural gardens, and urban areas. The tailless tenrec is the largest land-dwelling species of the tenrec family, Tenrecidae. It is 26 to 39 cm (10 to 15½ in) in length and weighs 1.5 to 2.5 kg (3¼ to 5½ lb). It has medium-sized, coarse grey to reddish-grey fur and long, sharp spines along its body. It not only eats small invertebrates among leaves, but also scavenges and hunts frogs and mice. If threatened, this tenrec will scream, erect its spiny hairs to a crest, jump, buck and bite. It shelters in a nest of grass and leaves under a rock, log or bush by day. It gives birth to a litter of as many as 32 young, with an average litter between 15-20 after a gestation of 50–60 days; when young, they have a black-and-white striped appearance. 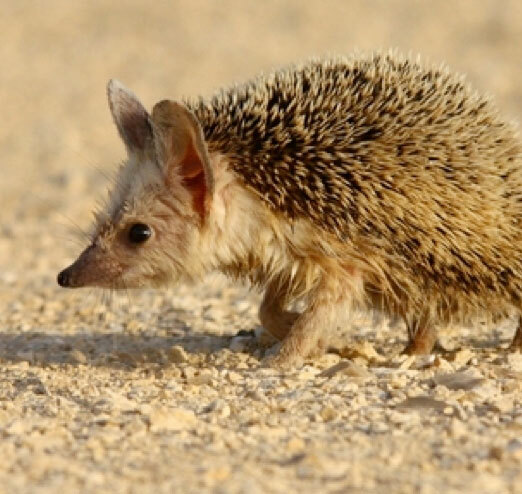 Despite being sometimes known as the tailless tenrec, they have a small tail 1 to 1.5 cm (⅜ to ½ in) in length.